I enjoyed listening to this conversation on "Christ the Center" about David Gordon's new book, Why Johnny Can't Preach (P & R, 2009). His thesis: We're too dependent on the visual rather than the spoken word. The "Winter" 2009 issue of the Evangelical Forum Newsletter has been posted online just before the ending of March (!). Bonnie will have her JPBC volunteer office minions send out the print copies this week. Thanks for all her labor in doing the EFN! An editorial on "The New Calvinism" (p. 1). An article on "Limited Atonement" (part 4 of 6 in our Doctrines of Grace series) (pp. 2-8). An article by Rob Stovall on "Revival and the Regulative Principle in 2 Chronicles 29" (pp. 9-10). Book reviews of D. A. Carson's Memoirs of an Ordinary Pastor (Crossway, 2008) and Faith Cook's Troubled Journey (Banner, 2004) (pp. 12-14). And a Pardosis article from Andrew Fuller on reconciling apparently contradictory passages on the sovereignty of God and the responsibility of man (pp. 15-17). 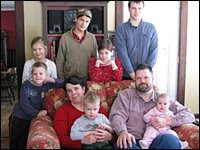 Photo: The Swanson family of Shelby, Michigan featured in the NPR report. "They speak about, 'If everyone starts having eight children or 12 children, imagine in three generations what we'll be able to do,'"Joyce says. " 'We'll be able to take over both halls of Congress, we'll be able to reclaim sinful cities like San Francisco for the faithful, and we'll be able to wage very effective massive boycotts against companies that are going against God's will.' "
Consistently the best-selling book on the planet, publishers are constantly repackaging it to lure new audiences. Harper One in October released the Green Bible, looking at the Bible through the lens of the environment. In an effort to keep it true to its eco-conscious motif, it was printed in the United States on recycled paper with soy ink, and has a sustainable linen cover. "It is still printed on paper though," conceded publisher Mark Tauber, who said a digital format would be greenest. Tauber said publishers were hoping to capitalize on the growing trend in Christian circles of eco-theology and creation care. The Green Bible is filled with essays from across the theological spectrum as a companion to the text. Former Archbishop Desmond Tutu wrote the forward while Brian McLaren, a popular progressive author and pastor, and N.T. Wright, the staunch conservative theologian, contributed essays. Anytime the text mentions something about the environment, the letters are printed in green, similar to how some Bibles print the words of Jesus in red. I also noted that the problem with those who push for so many modern Bible translations is that they think the reason people do not read and cherish the Bible is simply because it is not packaged in a format that they can understand. No, the problem is much deeper than that. As Paul said, the problem is that our sinful tendency is to suppress the truth of God. You don’t have to urge a converted man to read and cherish God’s Word. You also don’t have to convince him that its doctrines are worth believing and its ethics are worth practicing. 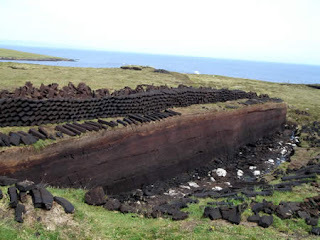 I ran across this message the other day by David Silversides of the Loughbrickland Reformed Presbyterian Church in Northern Ireland on "Internet Blogging and the Christian." It's worth a listen. There’s been some dust kicked up at the moderate news service ABP over an opinion piece article titled "Was Jesus a Racist?" written by Migual De La Torre back on February 23, 2009. In the article De La Torre looks at Jesus’ conversation with the Canaanite woman in Matthew 15:21-28 and turns it into a naïve political commentary on the treatment of illegal aliens. More disconcerting that the eisegesis and very poor hermeneutics, however, is the heterodox Christology the article puts forward. In De La Torre’s reading, Jesus was a racist, and the woman was his teacher. He concludes: "And thanks to her, Jesus’ ministry was radically changed." And: "Her remark shocked Jesus into realizing that faith was not contingent on a person’s ethnicity." The article set off an appropriate flurry of protest in the posted comments (worth reading). De La Torre responded with a follow up last Wednesday (March 18, 2009) with another article titled "Why I am a Heretic?" in which he defends himself as heroic heretic fighting the status quo and pushing the boundaries of interpretation. He even makes Jesus out to be a heretic: "Although I am no Christ, I follow in his footsteps with all my heart and mind, using his own form of heresy as my model." I was also struck by this statement in the article: "We Christian heretics believe the Word of God is inerrant." That comment shows just how emptied of meaning the whole concept of "inerrancy" has become among self-professing evangelicals. Even social gospel liberals who have abandoned orthodox conceptions of Christology are inerrantists! Maybe some in moderate Baptist churches will read these articles and the comments posted on them and wake up to what is really being promoted in moderate Baptist theological circles. ATLANTA – Remember the baby boom? No, not the one after World War II. More babies were born in the United States in 2007 than any other year in the nation's history — and a wedding band made increasingly little difference in the matter. The 4,317,119 births, reported by federal researchers Wednesday, topped a record first set in 1957 at the height of the baby boom. The birth rate rose slightly for women of all ages, and births to unwed mothers reached an all-time high of about 40 percent, continuing a trend that started years ago. More than three-quarters of these women were 20 or older. 1. The focus on the gospel. 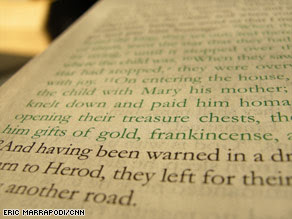 The first words of the book are, "The beginning of the gospel of Jesus Christ, the Son of God" (1:1). Among the final words are the Great Commission: "Go into all the world and preach the gospel to every creature" (16:15). In between these two book-ends is the good news of the life, death, and resurrection of our Lord. 2. The centrality of the cross. I remarked several times in the study that Mark has been called "a passion narrative with an extended introduction." This Gospel reminds us of the centrality of the cross work of Christ in our faith. Maybe the key verse of the Gospel is found in Mark 10:45: "For even the Son of Man did not come to be served, but to serve, and to give His life a ransom for many." 3. Jesus is our great prophet, priest, and king. I was struck by how Jesus is presented as a prophet who predicts things that will happen from where his disciples will celebrate the Passover (14:13-16) to his second coming at the end of the ages (13:26-27). He is a perfect priest who is also the perfect sacrifice offered to God. He is the king whose coronation is in humiliation. As Peter confessed, "You are the Christ" (8:29). 4. The continuity and harmony of the four canonical Gospels. In reading Mark, I was often comparing Matthew, Luke, and John. I was reminded of God’s wisdom in these four distinct witnesses, all of which aim to bring the hearers to believe that Jesus Christ is the Son of God, and that believing we might have life in his name (John 20:31-32). 5. The reliability of the traditional text of Mark including the ending of the Gospel. This study of Mark gave me opportunity to think again about issues related to the text of Scripture and to reaffirm that the ending of this Gospel is Markan, inspired, and canonical. Mark has been a faithful companion and teacher over the past year or so. I know I am the better for this study, and I pray it has been a blessing to our body. Oneida, Ky. - We are on the verge – within 10 years – of a major collapse of evangelical Christianity. This breakdown will follow the deterioration of the mainline Protestant world and it will fundamentally alter the religious and cultural environment in the West. Is this just gloom and doom? Read the rest of the article. Many of his observations seem to me on target as to why he thinks this will happen, including the failure of the church to educate its young people in an orthodox form of faith. Among his other predictions: The "emerging church" will be a flash in the pan that will disappear from the evangelical landscape; "Aggresively evangelistic fundamentalistic churches will begin to disappear"; and many will give up on "political engagement" in favor of deeper discipleship. In the end he does not see this as a necessarily bad thing. In his view evangelicalism doesn't need a "bailout" but a "funeral." I definitely don't see eye to eye with him on all his observations. He sees the future of "evangelicalism" surviving among charismastics, in home-churches, and in non-denominationalism (obviously revealing his own bias and preferences). Still, he provides some good food for thought on the weak state of the evangelical church. I saw this news story the other day linked at sermonaudio.com about a North Carolina judge's order that three homeschooled children be returned to public schooling. Sadly, the case involves a dispute between parents who are divorcing. The mother is a Christian who desires to homeschool her children. The father is concerned about her religious slant and the fact that his kids aren't getting "mainstream science." By all accounts the children are academically above grade level, content, and thriving. So, why does the Dad's conscientious objections take precedence over the mother's? Is this a case of religious discrimination? 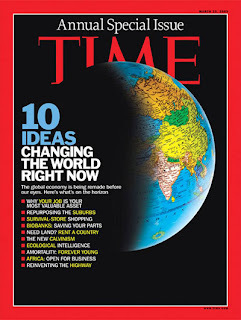 The latest issue of Time Magazine includes a cover article on "Ten Ideas Changing the World Right Now." Number three on the list is "The New Calvinism." Calvinism, cousin to the Reformation's other pillar, Lutheranism, is a bit less dour than its critics claim: it offers a rock-steady deity who orchestrates absolutely everything, including illness (or home foreclosure! ), by a logic we may not understand but don't have to second-guess. Our satisfaction — and our purpose — is fulfilled simply by "glorifying" him. In the 1700s, Puritan preacher Jonathan Edwards invested Calvinism with a rapturous near mysticism. Yet it was soon overtaken in the U.S. by movements like Methodism that were more impressed with human will. Calvinist-descended liberal bodies like the Presbyterian Church (U.S.A.) discovered other emphases, while Evangelicalism's loss of appetite for rigid doctrine — and the triumph of that friendly, fuzzy Jesus — seemed to relegate hard-core Reformed preaching (Reformed operates as a loose synonym for Calvinist) to a few crotchety Southern churches. No more. Neo-Calvinist ministers and authors don't operate quite on a Rick Warren scale. But, notes Ted Olsen, a managing editor at Christianity Today, "everyone knows where the energy and the passion are in the Evangelical world" — with the pioneering new-Calvinist John Piper of Minneapolis, Seattle's pugnacious Mark Driscoll and Albert Mohler, head of the Southern Seminary of the huge Southern Baptist Convention. The Calvinist-flavored ESV Study Bible sold out its first printing, and Reformed blogs like Between Two Worlds are among cyber-Christendom's hottest links. Calvinism continues to be a flashpoint of controversy in SBC circles. Christianity Today has an article reporting on recent rumours that SWBTS is about to purge five pointers from its faculty. Here in Virginia, the Baptist Banner's lead article in its March 2009 issue, What Should "Southern Baptist" Have to Do with "Calvinist"? is a broadside against Calvinists in the SBC written by Elmer Towns of Liberty University. Several folk have asked me about writing a response to this article. I have done so and hope to have it published or posted somewhere soon. Even More "60 Seconds in the Word"
How do you have peace? Why do men reject Christ? You can listen to all past "60 Seconds in the Word" episodes here. Mark 16:15: "And He said to them, ‘Go into all the world and preach the gospel to every creature.’"
"Go into a monastery and pray." Or, "Go withdraw from the world and look deep within yourselves." Or, "Go build a wall around yourselves and have nothing to do with anyone who does not believe in me." No, he says, "Go into all the world…." This is even more amazing when you consider that Jesus was saying this to a group of Jewish men who at this point considered it taboo even to have table fellowship with Gentiles. First, the Biblical method is preaching. What is preaching? Preaching is a man in Christ standing to speak from the Word of God about the things of God in order to draw together and edify the people of God. Preaching is the preferred method of Biblical ministry. Second, the Biblical message is the gospel. The word "gospel" means "good news." It refers to the "good news" about what God has been pleased to do in the life, death, burial, and resurrection of Jesus Christ. Third, the Biblical mandate is universal. They are to go and preach the gospel "to every creature." The gospel is to be preached without discrimination to every single human being as God’s unique image bearers within the creation. The apostles were not only to go to their fellow Jews, but to all nations. They were not only to go to men, but also to women. They were not only to go to the adults, but also to the children. They were not to go to the elite, but also to the lowly. They were not only to go to the wealthy, but also to the poor. They were not only to go to the educated, but also to the illiterate. They were not only to go to those whom they deemed most likely to respond, but also to those they deemed least likely to respond. There is a universal mandate for this gospel preaching ministry. [Moreover]…up to the hundredth year of his life he continued in [spiritual] darkness and in ignorance. His mind was in the weakness of a second childhood. He attended church as many people did in those days, but it seemed that every Sabbath Day the Word of God made no impact on him. What could you expect from such a man as this, an aged man, a man now coming into the experience of the second childhood? Oh, that Christ would so appear to us! Oh, that on the Sabbath Day as we go to the house of God it would be like no other day in our experience: that we might see the Beloved through the preaching of the preacher, that with the preaching of the preacher Christ may be conveyed to our souls! Note: The article cited above: Rev. N. Pfeiffer, "The Believer’s Love," TBS Quarterly Record (Jan-March 2009): p. 17. Note: This is a series of occasional verse by verse expositions of Jude. An archive of this and past commentaries may be found under the label "Jude Exposition" below. Jude 1:14 Now Enoch, the seventh from Adam, prophesied about these men also, saying, "Behold, the Lord comes with ten thousands of His saints…." Jude has gone into much detail to describe the depraved false teachers who were plaguing the believers and churches to which he was writing. In vv. 14-15 he shares a prophecy of impending judgement. A day of reckoning is coming on which the false teachers will be confronted by the Lord himself. The prophecy begins in v. 14: "Now, Enoch, the seventh from Adam prophesied about these men…." Jude then quotes a prophecy from the ancient figure Enoch. As Jude points out, Enoch was seventh in the line from Adam (see Gen 5:1-24). Most notably, Genesis 5:24 tells us that after three hundred and sixty five years of life, "Enoch walked with God and was not, for God took him." In this he was like the prophet Elijah who was also taken up from the earth without tasting death (see 2 Kgs 2). The non-canonical book from which the quotation comes is called The Book of Enoch or 1 Enoch. This book was not a part of the inspired Scriptures, and some have questioned why Jude would use such a quotation (recall a similar discussion at Jude 1:9). Obviously in using this one quotation, Jude is not validating everything in the book from which it was taken. The inspired authors were perfectly free to draw upon non-inspired works. Paul, for example, often quotes pagan poets in his letters (see Acts 17:28; 1 Cor 15:33; and Titus 1:12). Jude quotes Enoch’s reference to the return of the Lord in glory: "Behold the Lord comes with ten thousands of His saints." The Lord here is the Lord Jesus Christ (cf. Rom 10:9; 1 Cor 12:3; Phil 2:11). His coming is his parousia, the second coming in glory to judge the living and the dead. He is accompanied by a myriad of the saints. The saints are those who have fallen asleep (died) in Christ and who are already present with the Lord in glory. Paul refers to this in 1 Thessalonians 4:14 when he says "even so God will bring with him those who sleep in Jesus." They will accompany Christ in his triumphant coming. These false teachers have perhaps scoffed at Christ’s second coming (cf. 2 Peter 3:3-4). Jude reminds them, however, that one day they will have to stand face to face with Jesus himself and answer for what they have taught about him (cf. Heb 13:17; James 3:1). This word both assures teachers of truth that one day their cause will be vindicated and warns teachers of falsehood that one day their deeds will be exposed. How does the knowledge that one day Christ will return as judge affect the way you live your life now? Why would God allow quotations from uninspired writings to be included in the inspired Scriptures? What does this verse tell us about the future destiny of those who die in Christ? What kind of encouragement does this verse provide for teachers of the truth? One of the classes we are offering in the new quarter of Sunday School at JPBC is called Spiritual Disciplines Within the Church and is being taught by Steve Belcher. The class is based on the book by Don Whitney of the same title published by Moody in 1996. Some of you may also remember that we had Don Whitney, who now teaches at the Southern Baptist Seminary in Louisville, do a weekend conference at JPBC a few years ago. In this book Whitney examines what we might call the "corporate" spiritual disciplines. These are the things we do together with the church that help us grow in the grace and knowledge of the Lord Jesus Christ. Whitney also has a valuable book on developing personal or individual spiritual disciplines (Spiritual Disciplines for the Christian Life [NavPress, 1991]; in fact in the month of March 2009 you can download an abridged audio of this book for free here). Why worship in the church? Why witness in the church? You prove that you are not ashamed to identify with Christ or his people. You stop being an independent Christian. You participate in a stronger, more unified effort of God’s people. You have a greater opportunity to use your spiritual gifts. You openly demonstrate the reality of the Body of Christ. You participate in a more balanced ministry. You demonstrate your commitment to "the proper working of each individual part." You encourage new believers to commitment to the local body of Christ. You encourage a ministry when you consider it faithful and join it. Note: From Evangel article 3.4.09. This message was preached last month at the True Church Conference in Alabama. Mbewe has been called the "Spurgeon of Africa." He will be preaching at our 2009 Evangelical Forum meeting at JPBC September 25-26. He will also be preaching in our Lord's Day worship on Sunday, September 27 at JPBC. Riddle kids enjoy a snow day in North Garden!